The CD74AC/ACT374 and CD74AC/ACT534 are supplied in 20-lead dual-in-line plastic packages (E suffix) and in 20-lead dual-in-line small-outline plastic packages (M suffix). Both package types are operable over the following temperature range: Commerical (0 to 70C); Industrial (-40 to +85C); and Extended Industrial/Military (-55 to +125C). The CD54AC/ACT374 and CD54AC/ACT534, available in chip form (H suffix), are operable over the -55 to +125C temperature range. 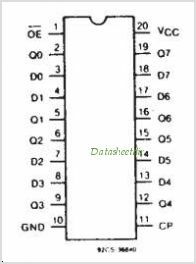 This is one package pinout of CD74AC374,If you need more pinouts please download CD74AC374's pdf datasheet. CD74AC374 circuits will be updated soon..., now you can download the pdf datasheet to check the circuits!